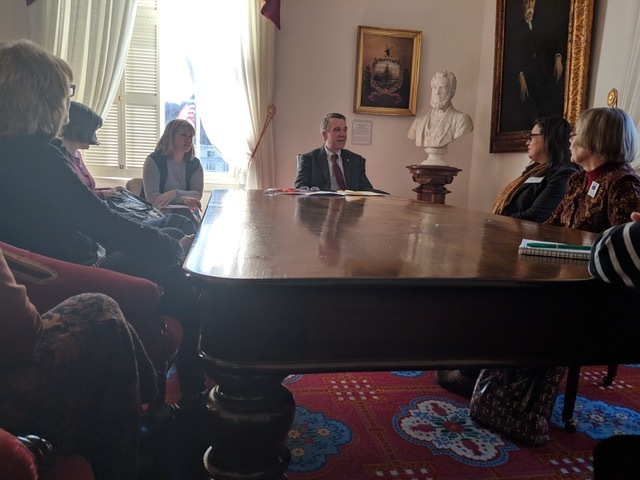 A dozen or so members of the League from around Vermont gathered at the State House on February 13 to celebrate the League's 98th anniversary and meet with our legislators. After sponsoring coffee and bagels in the cafeteria, we gathered in the Ethan Allen Room to get an update on bills of interest. Jon Groveman and Johanna Miller gave us progress reports on S.260 (Clean Water) and Carbon Emissions (H.763). Groveman reported that S.260 had called for establishment of a Clean Water Authority , and establish a Clean Water Assessment on all parcels in the state to fund water quality improvement projects in the state. This funding mechanism had been suggested by State Treasurer Beth Pearce. However, the original bill was scratched, and substitute language called for more study. We were encouraged to contact legislators, in particular the Senate Agriculture Committee to do no more studies and pass the bill as introduced. On the other hand, for H.763, we were asked to support funding for a $100,000, to find a way to make a carbon tax revenue neutral for Vermont drivers. We also took the first steps toward establishing a corps of legislative specialists in our League to follow priority issues and legislation. Two weeks after Legislative Day, we met with Governor Scott, who had to cancel the Legislatiave Day appointment. Because of events since Legislative Day, most of the conversation dealt with gun violence, with only very brief opportunity to bring up clean water or health care. The Governor did, however, tell us there would be money for Lake Champlain cleanup.